Whether it means driving to spend a few days in the mountains or the beach or getting on a plane to travel to a destination thousands of miles away, we are at the height of vacation time. While adults often long for the relaxation a vacation brings, it can sometimes be stressful for children. They may have questions about who will take care of their pets while they are gone, what it is like to fly on a plane, and how long it will take to get to the final destination. (My children have flown enough that they now ask how many planes it takes to get where we are going, and that indicates to them how far away it is.) To help answer children’s questions about vacations, it can be useful to read them a story related to their questions. Children may relate to the story and be inspired to ask the questions they have. Stories also give adults an “in” to start a conversation with a child. Violet and her family are going on vacation, but they can’t bring her dog, Pooch. Poor Pooch! Violet wants to bring Pooch along, but he can’t go. Instead, he will have his own vacation on Grandpa’s farm. Violet worries that Pooch will miss her and get terribly lonely, so she packs a bag with Pooch’s favorite toys and gives Grandpa detailed instructions on how to take care of him. But when Violet arrives at the beach for her family’s vacation, she realizes she has grabbed Pooch’s bag by mistake and he doesn’t have his favorite toys with him at Grandpa’s! Peppa Pig and her family are going on vacation, and that means getting packed, having Grandma and Grandpa take care of her pet goldfish, driving in the car for a very long time, and being prepared for adventures like nature hikes and exploring the beach. This story touches on many aspects of vacation that children might experience, including shopping for gifts for family at home and writing postcards. For those families not going on vacation, explaining the idea of a “staycation” to a child can be challenging. 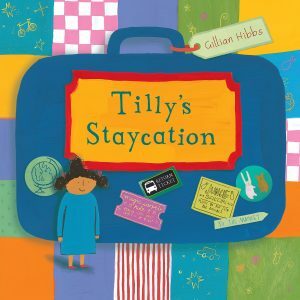 In Tilly’s Staycation, by Gillian Hibbs, Tilly has some trouble grasping the concept. Her friends are going on vacations to the ocean, foreign countries, and other states. Their parents are busy making travel reservations and filling suitcases. She can’t understand why her family isn’t planning anything at all. While the story doesn’t explain why Tilly’s family isn’t going on a vacation, her mother fills Tilly’s first day of summer break with fun experiences: eating breakfast in bed with mom, taking the bus to the library, finding a secret spot in the park for a picnic lunch, and finally creating a blanket fort in their living room where they “told stories all night.” By the end of the day, Tilly is happily thinking about her adventures and looking forward to telling her friends all about her staycation. Sometimes, vacations and staycations bring gloomy, rainy days, when children are stuck inside and easily bored. On a Magical Do-Nothing Day is about discovering the surprises around us, even when we think there is nothing to do. The story begins on a rainy day with a youngster in a cabin playing a video game. When the video game is accidentally dropped in a pond, the child bemoans that now there is nothing to do. But there are surprises outside just waiting to be discovered, and, as the child begins to explore, the world opens up, revealing smells, feels, and sounds that delight. Discovering one surprise leads to another and another, and the child gets a new perspective on the world. This article originally appeared in The Free Lance-Star.